Australians are blessed that the Bureau of Meteorology is so very good at predicting temperatures 100 years hence, not one of which has yet been proved wrong. In the shorter term, however, climatic divination could use some improvement. Above, the BoM’s nationwide rainfall as anticipated by the BoM’s modellers and computers on January 26. For products of our modern schools, who may well have spent less time studying geography than preparing rude placards to wave at the next kiddies’ march for climate justice, the area circled in red encompasses Townsville and surrounds. 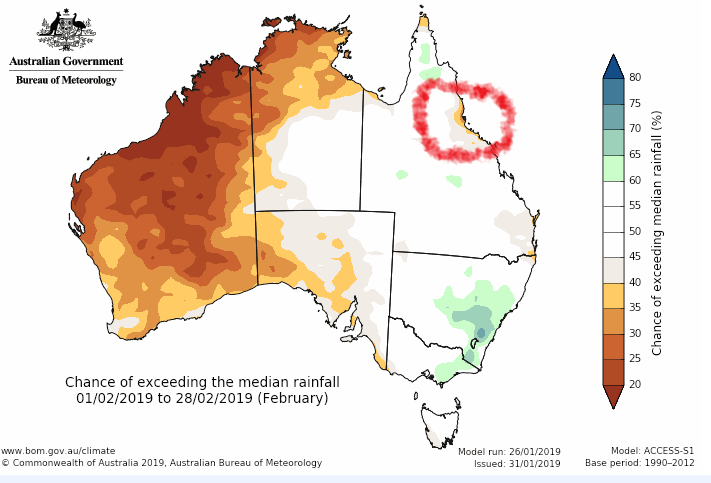 It has been a bit wet up that way of late, contrary to the BoM’s less-than-average prediction and no doubt much to its warmist modellers’ immense surprise. Not to worry. The BoM’s flim-flanneried view of the horrors to come in 2100 remains inviolate.